Well folks, it’s been two weeks since surgery which means FMLA is over. I’ve been nervous about going back to work because my energy levels vary from day to day, and two weeks was on the short end of my doctor’s recommended time off. But since I’m not a benefits-eligible employee, the time off has been unpaid. Pre-surgery deposits to the doctor and hospital + 2 weeks off work = VERY BROKE Nicole. Luckily, my work is computer-based, seated at a desk, so it’s not physically taxing. I work for an internet marketing firm, and my work is usually broken up in 15-60 minute sections, so it was good for my post-op attention span. Anyone who tells you that you think normally after two weeks of sitting around on drugs is lying to you. 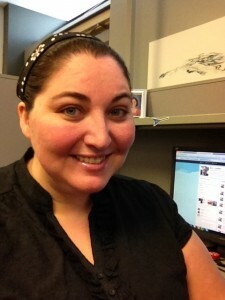 I was able to work from 8:00 until about 12:20, and then gave in to my fatigue. I came home, had some lunch, and then took a 2 hour nap. I took it easy the rest of the day. In the evening, my friend Esther came over to hang out and hear about my surgery. We watched some TV, chatted, and talked a lot about weight loss and the changes that are necessary for a successful weight loss surgery experience. With all of the unsolicited advice I’ve been getting since I announced my surgery publicly, it was nice to talk to a friend where I don’t have to explain the choices I’m making, especially regarding food. I have had countless people tell me that what I’m eating is wrong, that eating so few calories will kill me, that they know more about my body than my doctor does, or to watch one food documentary or another. I appreciate that people are trying to be helpful, but when I get dozens of opinions a day, it gets really exhausting. I am mindful of the foods I’m eating, and my body is no longer “normal” for regular nutritional advice. I’m going to listen to my doctor and my nutritionist, thank you very much. Another thing that’s hard is trying to tame my wild sweet tooth. I used to eat a lot of candy and pastries, and I often want something sweet in my mouth. The taste of sugar-free Jell-o is wearing on me, so I’m always looking for ways to have a treat that’s compatible with my diet. My husband brought home some of this Silk Coconut Milk the other day. It was good, but not enough on it’s own. 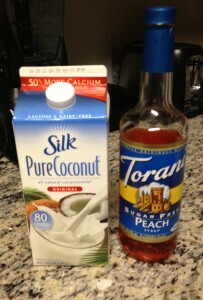 I pour about 3 ounces of coconut milk over ice, and add a splash or two of Torani sugar-free peach syrup. It’s delish! I call it the coco-peach delight, he calls it the “poor girl’s pina colada. Either way, it’s tasty. One of the things I’m really looking forward to when I go back to the U.S. (after 23 years in Japan!) is the ability to try sugar-free syrups like Torani and Da Vinci. The coconut milk with syrup sounds great. It’d be pretty awesome with nearly any flavor, I’d wager, but pineapple would seem to be a classic pairing (though personally, I’d probably go for vanilla). I know nothing about weight loss surgery or the required diets, but can you have sugar-free hard candy? That might help with the sweet tooth if they are permitted. It’s nice to have the option for sugar-free syrups, but there’s a lot in Japan that I’d KILL to have easy access to. Ok, maybe not kill, but I’d love to be able to buy it before it’s expiration date without a huge markup. I’ve had some sugar-free candies, but I hate the fake aftertaste. Ones sweetened with Splenda are the preferred choice, but I’m okay with most things as long as they have less than 17g of sugar or carbs. But I have a taste or two VERY sparingly. You have been one of the dozens of people who have had conversations like we did. But you have not been a bully about it like some people have. Nobody seems to want to believe that I’m following what my doctor and nutritionist have suggested. When I get my bloodwork done monthly, I’ll know if I’m having any deficiencies, and those will be addressed at that time. I would love to know more about the prescribed diet you need to stick with. I don’t know much about post-op food. It seems like you need to make sure you get your protein but I’m curious about the cheese too. It would make for an interesting post. BTW- keep up the good work!